Whether you are interested in culture, sport, adventure or history – this city appeals to everyone. The city of Graz is not just teeming with life and positive energy. Its many different aspects provide something to suit everyone; boredom is a foreign concept here. Culture, history which is alive and well, cuisine and numerous shopping opportunities are the order of the day here! 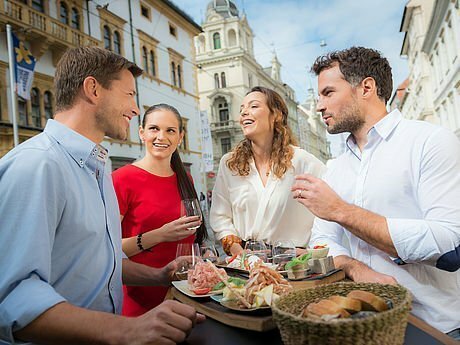 There are countless options open to all shopping fans in the centre of the city of Graz, like shopping centres and shopping streets which have numerous shops and boutiques for you to enjoy an extensive shopping spree. Culture lovers get to live it up in Graz too - whether it is at the opera, theatre or museum, art is alive and well here! Connoisseurs can sample the extensive range of restaurants, cafes and traditional inns. In this world-renowned wine area you will always find a suitable wine to go with every delicious food. 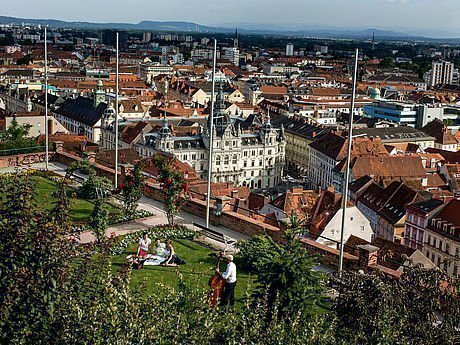 Graz's historic Schlossberg is located right in the heart of the city. The stunning rock face is located on the banks of the Mur and soars around 123 m above the main square. Next to the clock tower on the Schlossberg in Graz there is also a bell tower. 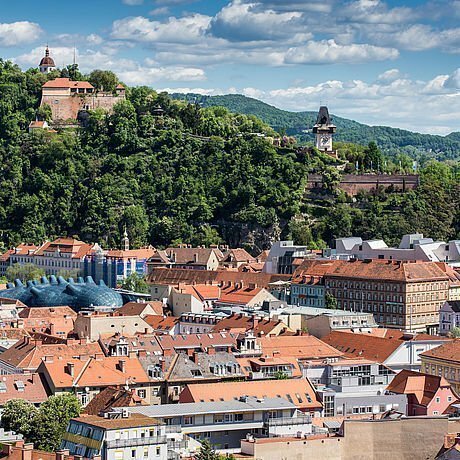 Graz's Schlossberg is a natural spectacle, a place of relaxation and a historic highlight. The fascinating history of Graz's Schlossberg extends right back to the 12th century - which is where its name comes from too! From the Slavic „Gradec“, &which translates as 'small castle';,the name of Graz later came about. The castle was extended as time went on and a series of art objects were added. Schlossberg in Graz also has a wonderful romantic garden with numerous walk ways to explore with some Mediterranean plants to see. 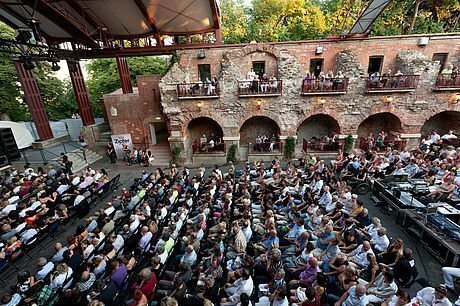 The most popular open-air stage in Graz is located on the Schlossberg plateau – Schlossbergbühne Kasermatten. This is where that visitors get to enjoy all kinds of events, from concerts to summer festivals to gala events. The atmosphere at Schlossbergbühne Kasermatten is indescribably atmospheric and romantic! In the cave system at Schlossberg in Graz there is also the „Dom im Berg“,a contemporary event and exhibition hall. As well as cultural and historic style, all of the old town area of Graz and its various shopping centres, fashion boutiques, and much more are waiting for you. 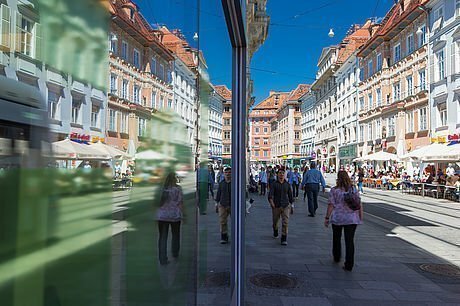 During your holiday in Styria as well as interesting sights in Graz you can also head to the shopping mile located between Jakominiplatz and the main square – 'Herrengasse'. Stroll between noble, fantastic rows of buildings and leisurely cafes and enjoy the hustle and bustle of the city. The adjoining Jakomini area brings together top quality handcrafted goods, designer items, innovative art as well as culinary highlights; Urban Lifestyle in the capital of Styria. In the Uni area, as well as an extensive shopping tour, a trip to one of the stylish bars is a must. From Murgasse which is li ned with shops, to art and museums such as Graz Museum on Sackstraße you can get back to the Schlossberg, where a breath-taking view across the city of Graz is your reward. Spend your evening in the Hotel Stoiser, for there, after an action-packed day, a relaxing time in the variety-packed sauna area in the hotel lies in store. The hotel is ideally located– it is so easy to get to all the shopping, cultural, and culinary highlights– and yet you get to stay t eh night in a tranquil and relaxing hotel. We also provide bespoke offers for your city break in Graz. In the city of Graz and its surrounding area there is something new to explore round every corner and at the end of every street! Has your curiosity been piqued? Then book a room in the Stoiser Hotel Graz and find out about all aspects of this wonderful historic, and yet contemporary, city.